The insufficiency of Scrum is a fallacy perpetrated by teams that don’t step up their practices in concert with their planning and don’t really want to make it work anyway. You can fail doing Kanban, XP, Merise and SSADM just as easily unless you have good engineering practices as well. The goal of Agile it to have you fail sooner and for it to cost less. 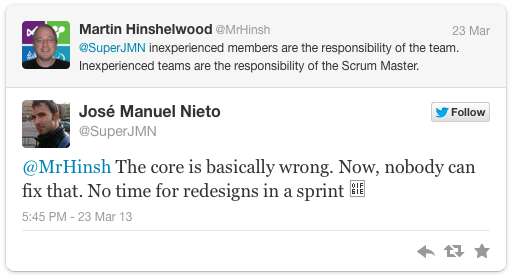 So what happens when you try to make your management practices more agile but forget about your engineers practices? We have to accept the fact that no process is perfect and that we will need to work hard at anything to make it work. Unfortunately we worked at traditional software development for over 40 years to prove that it did not work. But that is not really true…. it works in the small scale or if we are building something simple. I can’t think of any modern software that is either of those things. However Agile is not a silver bullet. I will say that again… Agile is not a silver bullet and you should read Scrum is hard to adopt and disruptive to your organisation. Most of the Agile Frameworks only cater for planning the ‘what’ and tells you to let the team decide on ‘how’ to build the software. Scrum, Kanban & Scaled Agile all focus on the Management process not the engineering practices. This does not mean that you don’t also need good engineering practices, and in fact the Scrum Guide explicitly tells you that your team needs “good engineering practices’ in order to succeed. If you don’t have those good engineering practices then you will spend more time sprint on sprint struggling with the technical debt that is built up and you will end up down an engineering blind ally. On of the reasons our team gets into this position is that they did not know that they was in a broken state until it is too late. If our organisation fails to understand the purpose of the retrospective as an inspect and adapt moment for ‘how’ we worked during our Sprint then one will fail to improve. But if we do get into that state then you are in the very same ‘brownfield’ situation as software that have been built over years with no unit tests. So if the primary goal now is working software that meets our customers expectations and we augment our Definition of Done to reflect that then we will be delivering less features of higher quality. While we are still paying back our excessive build up of technical debt, using those engineering practices that will prevent future build up, we will be delivering less value to the customer. Remember that the software that you are building is an organisational asset and decisions to cut quality affect the value of that asset and thus must be reflected in your organisations financial statements .Cutting quality in your software without first gaining the approval to do so from your financial executives is unprofessional at best and fraud at worst and always incompetence.